David is an attorney who lives in Madrona, works in downtown Seattle, and previously lived in several other Seattle neighborhoods, Kirkland, and Bellevue. 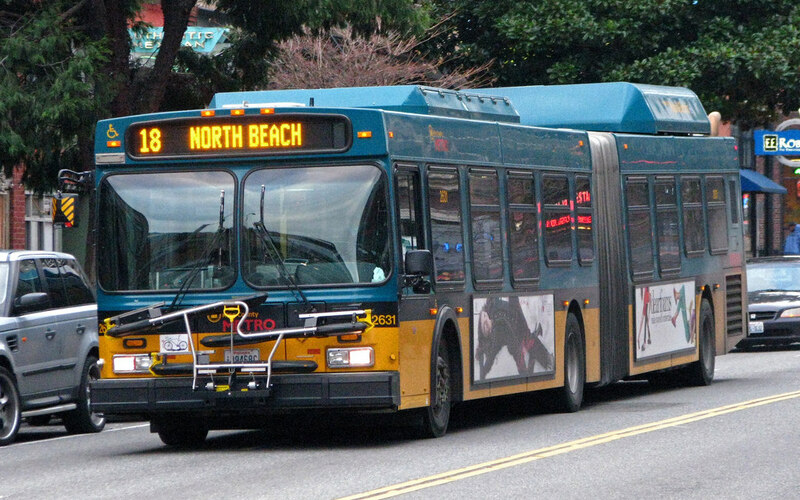 He writes mostly about King County Metro and how to improve the regional bus network. David drove for Metro from 2000 to 2005, and loved the job. His regular commute is by foot or on the 2. The roundly panned plan for the most critical segment of 35th. 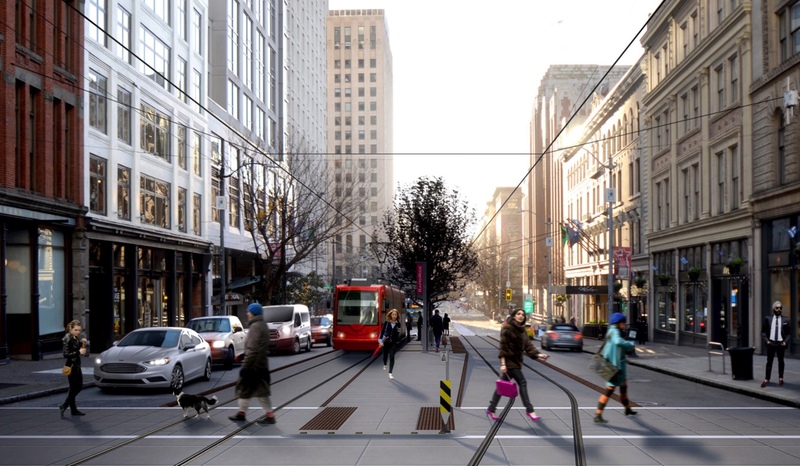 Rendering by SDOT. 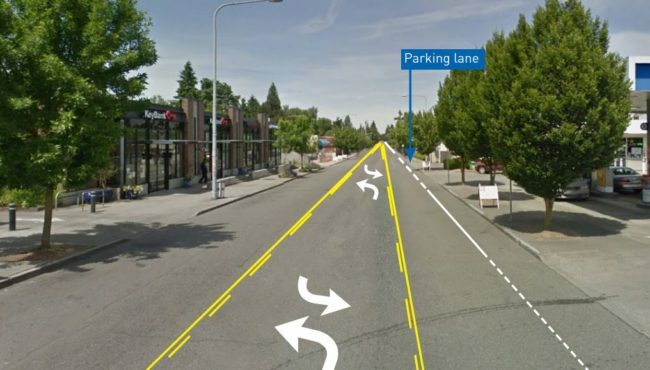 On Tuesday, SDOT announced an ugly split-the-baby solution to community deadlock over the planned redesign of 35th Ave NE, the central neighborhood arterial of Wedgwood and Bryant. The solution seems custom-designed to upset everyone in the debate, sacrificing both the bike lanes recommended in the city’s own Bike Master Plan and the street parking that was the central focus of opponents’ demands. Instead, drivers get a two-way turn lane for most of the corridor and freeway-style 12-foot general purpose lanes. The new design for 35th, with its wider lanes, additional passing opportunities, and inevitably higher speeds, is a serious threat to the safety of people outside cars. But the point of this post is not to re-litigate 35th, but to suggest a way for the city to avoid this sort of worst-case outcome in future projects. In short, to have any chance of meeting its own Vision Zero goals, the city must establish legally binding guidelines for the redesign of all arterial corridors, and then direct professional staff to follow them when it is time to design individual projects. And there is a very good local example of how to do exactly that: King County Metro. The details, along with some history, are below the jump. Orange and white Rider Alert signs are sprouting around the city like early March crocuses, which must mean it’s time for another Metro service change. Not so long ago, we dreaded these. Now we look forward to them. We’ve now had four years of improvements without any significant pain, as a combination of continued sales tax revenue growth and Seattle Proposition 1 investments have allowed the agency to address urgent needs and boost service levels throughout its network. This service change, which starts Saturday, March 23, is a little different. The local economic music has not yet stopped, so Metro is still adding hours. But, this time, riders won’t be seeing commensurate network improvements. Another significant change triggered by the tunnel closure is the opening of a new northbound bus pathway through downtown. While the existing three southbound pathways (Third, Second, and Fifth Avenues) had sufficient capacity to absorb the buses displaced by the tunnel, there were only two existing northbound pathways (Third and Fourth Avenues), and they lack capacity to absorb more buses. 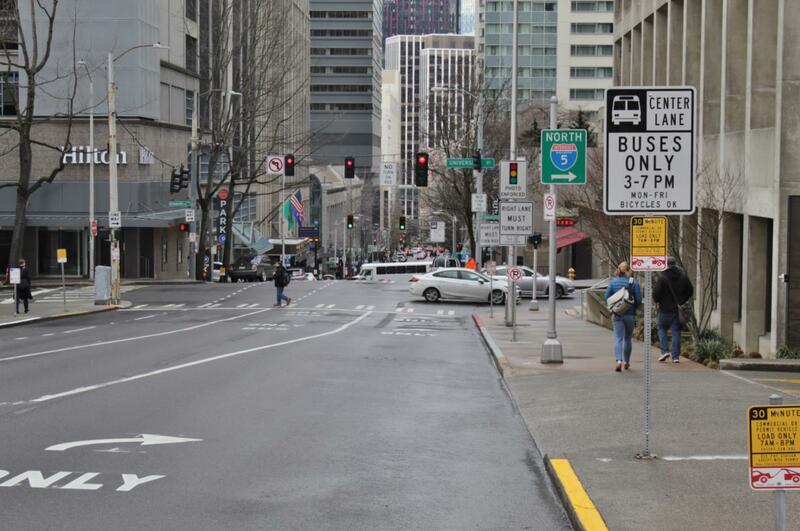 In response, SDOT and Metro have created a third northbound pathway, using a bus-only contraflow lane on Fifth Avenue south of Marion and middle bus lanes on Sixth Avenue north of Marion. 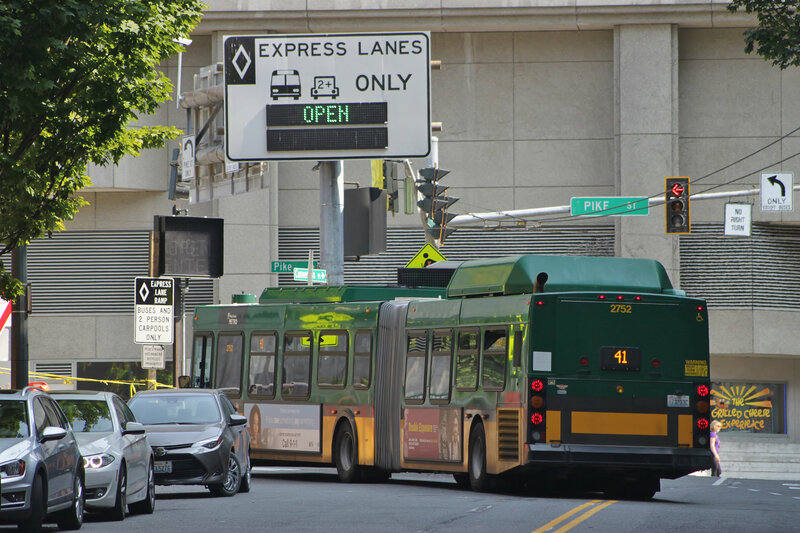 Those who have suffered through the Howell Street bus lane may be skeptical of the Sixth Avenue lanes; it remains to be seen how they will perform. 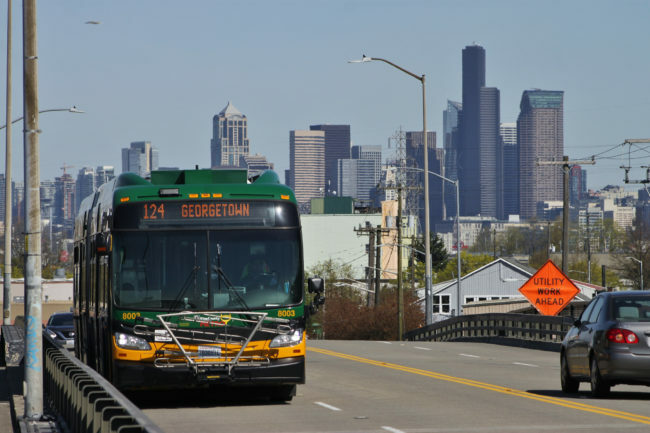 The new pathway will host one all-day route, the 255 to Kirkland, and a number of peak-hour routes to North King County and the northern Eastside. 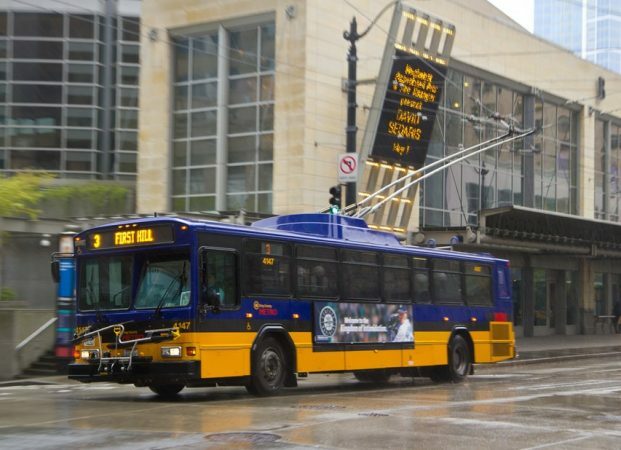 Also in an effort to improve bus capacity further, all-door boarding with off-bus ORCA card readers will be available at all stops on Third Avenue downtown. In addition to these major changes, there are a few network improvements. See the details below the jump. Metro route 41, soon to get more frequent. Photo by Bruce Englehardt. Over the last three years, we’ve gotten used to a continuous stream of service improvements from Metro. The pattern continues with this fall’s service change, which starts next Saturday, September 22. There are almost no substantive changes to Metro service this time around. 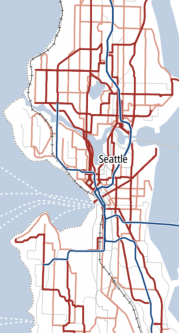 The big picture is a peanut-butter-style scattering of new trips throughout the Metro system, some funded by Metro itself and some by the Seattle TBD. The most headline-worthy addition is that routes 41, 70, and RapidRide E Line go to 10-minute frequency during the day on weekdays. This is a minor adjustment for the E Line, which already has 10-minute frequency most of the time, and just needed a few gaps filled. It’s a bigger change for the 41 and 70, both of which have 15-minute midday service today. Weekend and evening service will remain at current 12- to 15-minute frequencies on all three routes. Metro has finally disclosed what will happen to West Seattle Bridge and SR 509 service once the Alaskan Way Viaduct closes. The changes will happen in two phases. Phase 1 covers the time when both the viaduct and the new SR 99 tunnel are closed. Plans for this phase remain subject to change. Routes that currently use the Alaskan Way Viaduct to reach the West Seattle Bridge, including RapidRide C Line, 21 Express, 37, 55, 56, 57, 120, and 125, will use surface streets: 4th Ave northbound, and the current route 21 routing (but without local stops) southbound. Service on these routes will be slower, but stop locations shouldn’t change. Routes that proceed south on Highway 99, including 113, 121, 122, and 123, will use 1st Ave S south of S Lander St, missing stops along E Marginal Way S and resulting in a long walk for passengers in that area. Metro will shift to Phase 2 after the SR 99 tunnel opens and the new ramps connecting SR 99 to S Dearborn St are operational. All ex-Viaduct service will use 1st Ave S to reach those ramps and then resume normal route along SR 99, serving all normal stops. The Phase 2 routing will likely be in place for several years, until the City of Seattle has completed construction of the new Alaskan Way as far as Columbia St. 1st Ave S service has in the past been prone to delays, and it is still not clear if buses will receive any priority along 1st Ave S between Columbia St and S Dearborn St.
Other changes, all minor, below the jump. Rendering of the Center City Connector on First. Courtesy of Seattle Streetcar. In a classic holiday-Friday news dump, yesterday afternoon Mayor Jenny Durkan’s office released a summary of the long-awaited third-party report on the Center City Connector. The summary, prepared by Big Four accounting firm KPMG rather than a consultant with specialized transit expertise, brings both good and bad news for the CCC project. The headline number that drove immediate coverage, total capital cost, is definitely bad news. KPMG’s estimate is sharply higher than previous ones. For the project as planned before the Mayor’s March stop-work order, the total capital cost is now estimated at $252 million, up from $198 million projected in fall 2016. KPMG also studied a scenario where the CCC operates with lower peak frequency, reducing vehicle requirements, and found that the capital cost was not much lower, at $242 million. The city has not yet identified any funding source to cover the difference in the event that the project goes forward. The summary breaks down the increase into a few broad categories, but it is difficult to tell from the chosen categories how much of the increase is attributable to planning errors by the city and how much stems from the sharply more expensive construction environment that has also bedeviled Sound Transit and private projects throughout the area. Back when west-side local bus routes served First Avenue. Photo taken in 2009 by Andy Tucker. Pulling away just in time to make the green light at Cherry, I had about sixty people on board, which meant a few were in the aisle. More passengers got on at Marion, and more still at University. The big D60 coach started to feel a bit crowded as it climbed the steady grade of First, my right foot summoning equal parts motion and loudness. I knew the crowding would be brief. While making the announcement, I arrived at the zone, a bit less than a minute ahead of schedule. But I wasn’t worried about the technical violation of Metro rules. The departing stampede of both tourists and locals would use that minute and more, so I was in no danger of leaving early. Although the shelter was crowded with commuters waiting to get on, there would be plenty of seats for them once the “Pike’s Market” group had left. As usual, those few First Avenue blocks would be the busiest part of my entire trip, even though it covered the length of the city from Arbor Heights to Loyal Heights. What a Mercer student needing to catch a 107 bus sees today. Image from Google Maps. 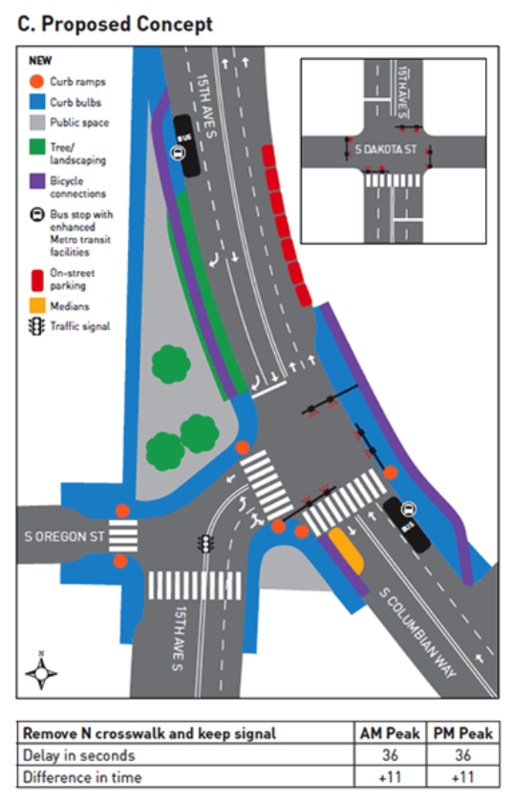 SDOT’s initial proposed design for 15th/Columbian. This design won praise from safety advocates, but some drivers in the community vehemently objected to the lack of a separate signal for eastbound drivers on S Oregon St (as exists today). 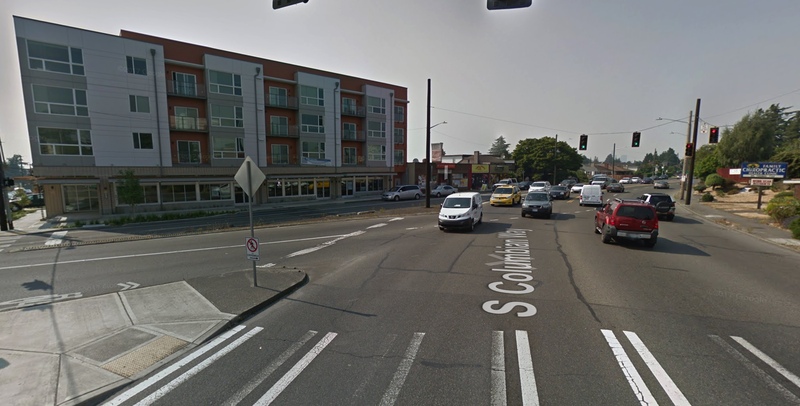 Drivers feared that they would be subject to long delays trying to turn left from S Oregon onto 15th Ave S. But when SDOT studied adding the S Oregon signal back, its modeling suggested that cars crossing the intersection would be subject to delays of two to three minutes. 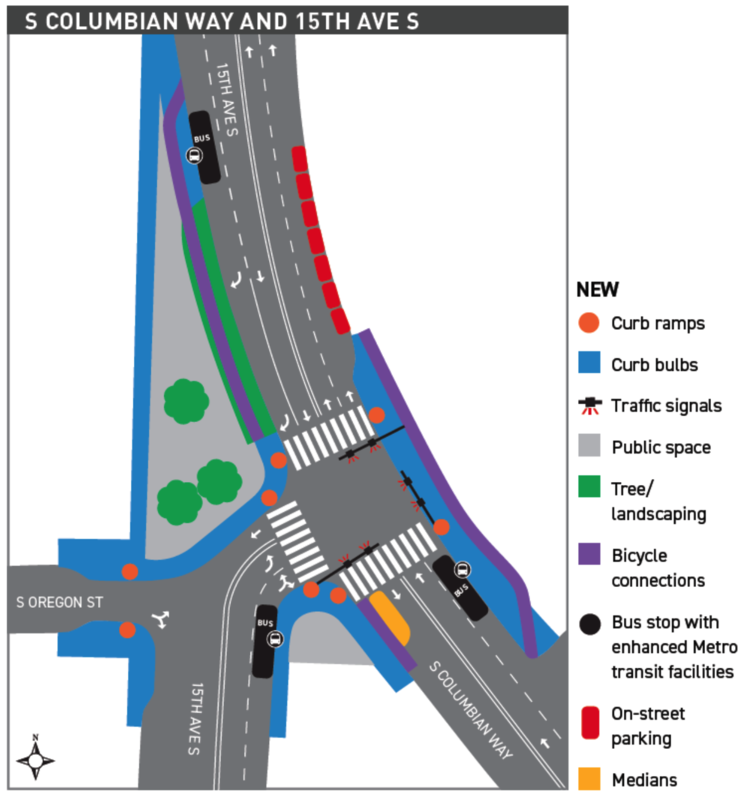 SDOT’s “compromise” design for 15th/Columbian. Hearing About Congestion Pricing? Ask About Transit Investment. A likely place for congestion pricing sensors. Photo by Bruce Englehardt. It’s safe to say that Seattle transit advocates are uncertain about Mayor Jenny Durkan’s commitment to transit. The fate of the Center City Connector continues to grow murkier. The Mayor told a large, powerful coalition of CCC advocates to talk to the hand. Several transit and safe streets projects throughout Seattle have been delayed or canceled (although others have proceeded on schedule). Funding shortfalls shrank and delayed RapidRide projects, while leaving expensive auto-centered projects like the Lander bridge unaffected. One Center City lost many of its transit priority ideas in becoming Imagine Downtown. Throughout all of this, the mayor’s office has not said much about transit, except occasionally to point out its numerical necessity in the most general terms. Extend the hours of the current car restrictions along 3rd to 6 a.m.-7 p.m. seven days a week (with 9 a.m. to 3 p.m. exception for permitted commercial vehicles). Ban left turns from 3rd Ave at all times. Remove on-street parking from Prefontaine Pl at all times. Install ORCA readers and real-time arrival signs at all 3rd Ave stops, not only those served by RapidRide. Move current southbound stop at James St one block north. Metro will also be adding a new northbound bus stop between Columbia and Marion at a later date, and presumably shuffling routes between stops for greater efficiency. We continue to think that painting 3rd completely red would be the best and clearest solution, and would be amply warranted by the volume of bus riders 3rd serves. But these changes are welcome, and better in some respects than the rumor mill and previous statements by SDOT staff had led us to believe. The 24/7 ban on left turns off 3rd is a particularly happy surprise. Left-turning cars frequently block the southbound through lane at all hours, holding up through buses. Banning left turns 24/7 will also cause TNC drivers’ navigation apps not to recommend those turns, while the apps appear to ignore peak-hour turn restrictions. It also wasn’t clear until recently that SDOT would extend car restrictions to weekends, despite frequent car-caused traffic congestion on weekend afternoons. The weekend restrictions should improve bus reliability, especially given Metro’s longtime tendency toward optimistic scheduling on weekends. With cars allowed in some places and at some times, enforcement will continue to be a challenge, as it is today. 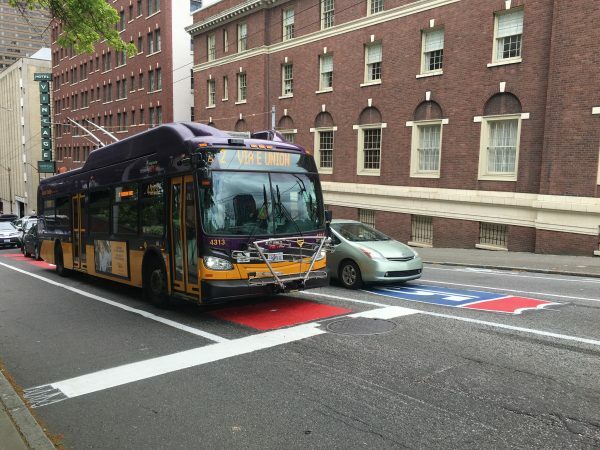 Enforcement of existing restrictions by SPD and Metro Transit Police has been inconsistent, and typically absent when traffic crashes or special events create gridlock on surrounding streets—allowing the gridlock to spread to 3rd and paralyze bus service too. SDOT and SPD should prioritize enforcement more than they have to date. In particular, more, not less, enforcement should happen on days when car traffic elsewhere is heavier than usual, so buses can provide a resilient alternative for people trying to get home. In response to several requests, this post is adapted from a recent Twitter thread that readers seemed to like, even though I impulsively started it during a break at work while irritated at some tweets. When we talk about supply, what we’re saying isn’t remotely “supply will fix everything wrong with housing.” It’s “without more supply, it’s really freaking hard to fix anything.” Adequate supply makes it much easier and cheaper to do lots of good things, both in and beyond housing. The environment of extreme housing scarcity (which has been around throughout the adult lives of many West Coasters under 35!) corrupts every public effort not only to house people, but to improve their lives in myriad other ways. In an environment of housing scarcity, landlords have so much leverage that they can completely hijack progress on many goals that have consensus support among all factions of the West Coast left. Wage increases, subsidized health care, and subsidized child care end up allowing people to pay more for rent–and, where housing is scarce, landlords can & will demand that they get all of the extra money such efforts put in people’s pockets. Making housing public (while it may be desirable for other reasons) doesn’t address housing scarcity on its own. A government agency that operates public housing is still a landlord, and it still has leverage, even though that leverage may get exercised in ways other than higher rent. Where there’s scarcity, public homes often get allocated according to connections, insider relationships, seniority in the area, or just plain luck. Rich people make illicit deals with the lucky winners to occupy units. Scarcity gives landlords leverage. But the best way a tenant can exercise leverage over any landlord, private or public, is to say “Screw you, I’m moving.” That can’t happen where housing is scarce. But it can happen. I’ve experienced it: in my 20s, making $11-12 per hour, I moved out of an apartment where the landlord was trying to sharply increase my rent, because other apartments were readily available at reasonable cost. Getting to an environment where “screw you, I’m moving” is a credible threat can’t happen immediately. But it is possible, and it requires three policy changes: 1) tenant protections to make moving cheaper (which might include lower penalties for early move-out, lower security deposits, and a uniform low-fee application); 2) serious fair housing enforcement that is strong enough to address widespread discrimination against renters of color and renters with disabilities; and 3) yes, sufficient supply. “Sufficient supply” has to be at a local level. A frequent criticism of supply-side housing advocates is that more supply helps at a region-wide level, but can have localized negative effects that people ignore. That’s valid! It doesn’t give a tenant any helpful leverage when new supply is all in other places, or when it’s all extremely expensive because there’s not enough of it. Saying “screw you, I’m moving… 20 miles away where there’s housing” isn’t real leverage. Real leverage for tenants is the ability to move locally, so that a move doesn’t upend a tenant’s life or create a horrible commute. How to achieve that will vary, a lot, between neighborhoods. In wealthier areas with less risk that low-income tenants will be displaced, it’s good enough to say “upzone, and let developers build as fast as possible.” But we need to add supply in poorer areas too, because tenants there are so much more prone to exploitation and displacement when there is housing scarcity. It’s impossible to address housing scarcity in an area without adding lots of housing there. And, again, supply by itself is not enough. More supply in low-income areas will not fix poverty. It won’t ever provide housing for the lowest-income populations, which don’t tend to be served well by housing markets. Initially, it won’t even provide working-income tenants with any leverage, until enough is built that scarcity is eased. All these things are true. And, even so, we still need to build everywhere in the area to have any real effect on the condition of scarcity. If we don’t fix scarcity, other efforts will continue to spin their wheels like an articulated bus on ice. Anti-displacement and tenant activists will be Sisyphuses, trying to roll a heavy rock of landlord leverage uphill. Anti-poverty efforts will founder, because money will go to landlords instead of staying in the pockets of people with low incomes. Public housing won’t serve residents with very low incomes well, because people with more money will muscle in. New market construction will all be for the rich, even where it’s basic; so-called “luxury” apartments are rarely much different from cheap ones, except for their location. Housing abundance will ease all of these issues. Supply is not the end of the story. It’s just the beginning. But enough of it would make all of the other work that housing advocates do much easier, and is absolutely necessary to ease the stranglehold that landlords currently have on their tenants. It’s a huge project, that will take years of building, and there will certainly be problems to address along the way. But we need to keep building for the dream of a future without housing scarcity to have any possibility of coming true. KCM 6854 sporting unusual signage. Photo by Erubisu. After almost three years without any significant service cuts, we’ve gotten pretty used to happy service change announcements from Metro. The latest change, which begins this coming Saturday, March 10, is no exception. Service additions are sprinkled throughout the system without much countervailing bad news. (The redundant route 99 does disappear, but ridership numbers suggest that no one will notice.) This service change brings no major restructures of service, so increased service is the big story. It’s scattered throughout the system, but with a particularly welcome and overdue focus on the greater Kent area. minor routing changes in downtown Seattle and downtown Redmond to match changing traffic patterns. Metro route 3. Photo by Tim Bond. Online survey respondents favored the change, 53 to 40 percent. Most of the few people who contacted Metro by email or phone opposed the change. Stakeholder organizations were split along geographic lines; First Hill Improvement Association and WHEEL (which operates a women’s shelter near 8th and James) opposed the change, while Yesler Terrace Community Council supported it. Supporters cited better reliability and improved service to Yesler Terrace, while opponents concentrated on potential difficulties accessing services on James for seniors and people with limited mobility. In keeping with this split feedback, Metro plans to study a variety of options using both James and Yesler. 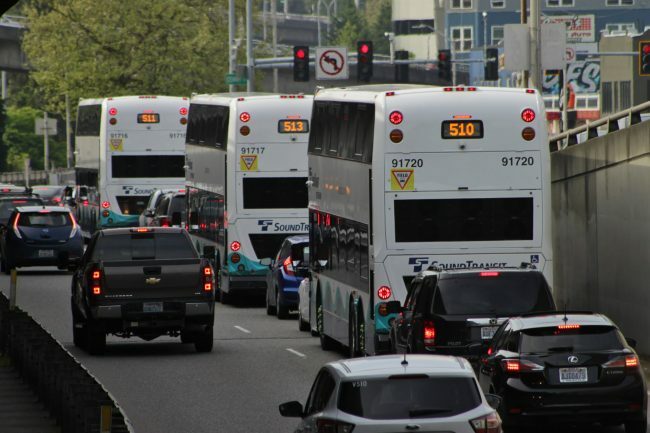 The agency will study transit priority measures on James, to see if there is any way to speed up buses despite the very high volume of I-5 traffic. 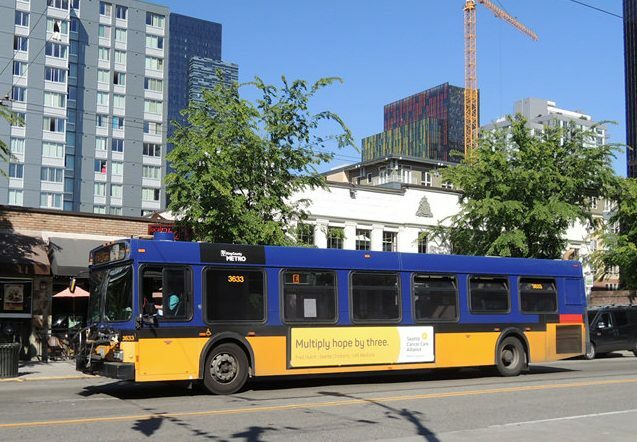 Previous studies have found bus lanes on James infeasible because the volume of I-5 car traffic trying to use James would create gridlock on other streets (including 9th Avenue, which the current routes use), but Metro will have another look. At the same time, the agency will continue designing trolley overhead and other infrastructure along the Yesler route. 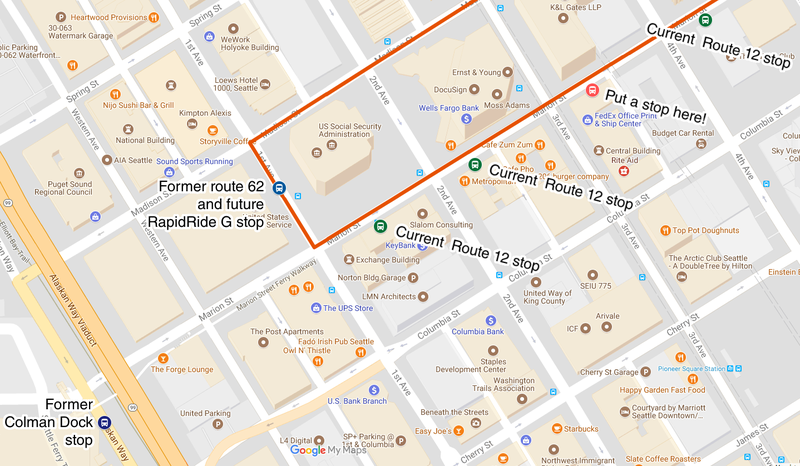 Finally, the agency will look at putting another (presumably less frequent) route onto James to provide access while moving routes 3 and 4 to Yesler. By its nature, this feedback process could not include any voice representing the over 5,000 net new residents (including about 1,100 low-income residents) who will come to Yesler Terrace once redevelopment ($) is complete. Redevelopment will turn Yesler Terrace into one of the city’s densest areas, and no comparable development is proposed for the area around James Street. Yesler Terrace and downtown are currently connected only by infrequent route 27, which is obviously insufficient to serve the new population. As a regular route 3 rider, I think the combination of reliability improvements and Yesler Terrace redevelopment makes the move to Yesler the obvious best option for routes 3 and 4. Community feedback regarding access to the James/5th and James/8th stops, though, may warrant moving a low-ridership coverage route (the 27?) to James to serve those stops, despite the delays for riders that will certainly result. Drivers of a car and a Metro bus doing it right. We’ll ignore the car behind the bus. Photo by Mike Bjork. More and more of us are riding transit every day. But the numbers say we also drive cars ($). 81 percent of Seattle households (including my own) still own at least one car. Many of those who don’t own cars use car sharing from time to time. Cars aren’t a sustainable solution for the majority of urban travel, but they will always be the best tool for certain trips. Unfortunately, they’re also highly lethal, to the tune of over 40,000 deaths annually across the country—a number big enough to qualify as a leading cause of death and a major public health problem. In Seattle alone, we had 21 traffic fatalities in 2016, including 7 pedestrians and 5 cyclists killed. Nearly all of those fatalities are caused at least partly by driver inattention. If you are a driver, you can reduce this risk! In last year’s “Driving for Urbanists” post, Zach described several ways drivers can make streets safer, most of which amount to treating other users with respect and courtesy. This time, I want to zoom in on just two aspects of respectful driving: crosswalks and lane control. Paying attention to these two things will make your driving as a whole much less threatening to vulnerable road users. Yes, That Is A Crosswalk. Drive Accordingly. Yesterday, the City of Seattle published the final Environmental Impact Statement for its citywide Mandatory Housing Affordability (MHA) rezone proposal. Citywide MHA is the key to the “Grand Bargain” at the center of the city’s Housing Affordability and Livability Agenda (HALA). In a nutshell, Citywide MHA would upzone many of the more urban parts of Seattle, in exchange for requiring developers in the upzoned areas to build (or pay for) a modestly higher amount of affordable housing as part of their projects. The city describes the key objective of Citywide MHA as “increasing housing and jobs near frequent transit.” That’s a laudable goal, and absolutely necessary for the city’s continued growth. Many of Seattle’s roads are at capacity and we don’t have room for more. Geometry requires that further transportation capacity must come from transit, walking, or cycling. People only use transit if it’s easily accessible to them. Allowing more people to live near frequent transit will boost both transit ridership and total transportation capacity. For that reason and also for the affordable units it will generate, Citywide MHA is a positive step that we should support. But it doesn’t go nearly far enough. We have the transit infrastructure to support much more housing than Citywide MHA anticipates, and thereby accommodate more of our new arrivals with less displacement of existing residents. Given the crisis of unaffordable housing prices in Seattle, we owe it to ourselves to do so. Map by City of Seattle. Map by King County Metro. And that’s not all. If funding allows, Metro wants to add yet more frequent corridors in connection with future Link openings. By 2040, Metro would blanket nearly the entire city in frequent service, as shown at right. But Citywide MHA takes relatively little of this into account. A plan to “maximize housing and jobs near frequent transit” ought to upzone all along these frequent transit routes. Instead, the city’s interactive map shows lots of places directly on current or future frequent transit that remain stubbornly single-family. These areas ought to be upzoned too. From City of Seattle interactive map. 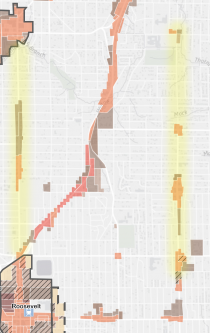 Highlighted corridors are Roosevelt Wy NE and 35 Av NE. The case of Northeast Seattle is particularly instructive. A combination of a Link restructure and substantial city funding created two amazing frequent corridors along Roosevelt Way (route 67) and 35th Ave NE (route 65). These corridors now have buses running every 10 minutes, six days a week, and every 15 minutes until late at night. But the map shows how little Citywide MHA changes along the corridors (highlighted in yellow). There is barely any increased zoning, and lots of territory directly along the routes remains stubbornly single-family. Frequent transit capacity will go to waste. A look at the Citywide MHA map reveals many other corridors throughout the city that have similar potential. Corridors like route 36 along Beacon Av S, route 62 in View Ridge, and RapidRide C in Fauntleroy represent potential opportunities for people to live car-free. All frequent transit corridors should have much more color on the map. Even after Citywide MHA takes the first baby steps, the city should keep moving further, so we can make the most of our newly expanding frequent transit network. Will Metro’s New Union Contract Bring More Service? A few weeks ago, Lizz reported that the union representing Metro bus drivers, mechanics, and service supervisors (among others) approved a new collective bargaining agreement with significant changes to work rules. The most notable of these changes is that part-time Metro drivers can work on weekends. In exchange, union negotiators secured two big concessions from Metro. First, Metro accepted a lower ceiling on the number of part-time drivers, with the limit changing from 45 percent to 33 percent of all drivers. Second, Metro agreed that no drivers, either full- or part-time, will have to work split shifts on weekends. The changes will be effective in September 2018. Far from being the arcane, inside-baseball news you might think, this is a major win-win for Metro and the union, and a big deal for Metro riders. If implemented well by Metro, it could result in more service on the road for the same amount of money. 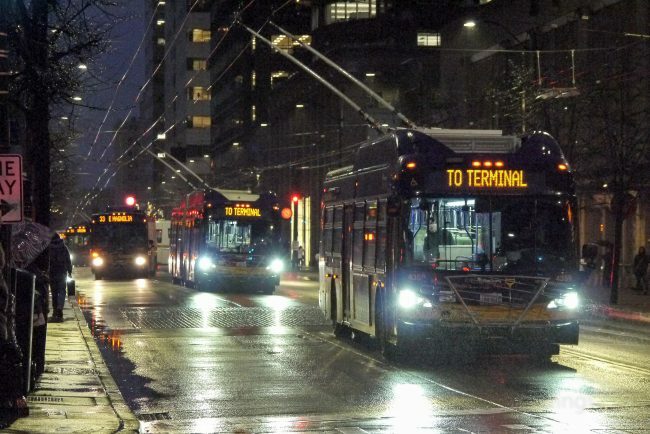 Depending on how drivers ultimately choose to pick their work under the new rules, it could also make driver recruitment easier—important in an era where Metro has been struggling to keep enough drivers to operate current service, let alone add significant service hours as funded by the City of Seattle and contemplated by Metro’s own Long-Range Plan. To explain why this is such good news, we’ll have to dive into the murk of bus-driver work rules a bit, below the jump. The south half of downtown, set on a steep hill, has always presented accessibility problems. With elevation changes of as much as 50 feet per block, people with impaired mobility frequently have difficulty traveling even one block in the east-west direction. 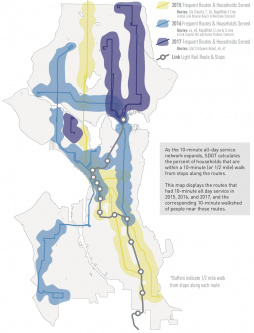 For the transit network, this results in an intermodal transfer challenge: there is more than 100 feet of elevation gain in the four blocks between the Colman Dock ferry terminal and Metro’s Third Avenue transit spine. Historically, Metro handled this challenge by having one or two north-end routes serve Colman Dock directly, laying over on Alaskan Way. The routes climbed to Third Avenue via Yesler, providing accessible transfers to other service, before heading north. But when waterfront construction began in earnest in 2012, Metro had to leave Alaskan Way. Instead, it began using First Avenue, which is at nearly the same elevation as the upper level of Colman Dock and accessible from the dock via a safe, flat pedestrian bridge. First route 16, and then route 62 starting last year, picked up on First and used Seneca to bridge the elevation gap between First and Third. But now, Metro is again getting displaced, this time by Center City Connector construction along First. On September 23, route 62 will begin using Third exclusively. And this presents a significant problem for users who have difficulty making it up the hill. During the day on weekdays, there is an accessible route from First to Third, using public elevators or escalators inside two downtown buildings. But the accessible route is not available nights or weekends. The only meaningful transit service that will now serve the vicinity of Colman Dock is route 12, a frequent east-west route using Madison and Marion Streets. And it gets worse. Route 12 doesn’t make the trip to Third easy, because it has no stop near Third. Uphill stops are located on Marion at First, near the end of the Colman Dock bridge; at Second; and then on the far side of Fourth. Given that the vast majority of transfer connections are on or under Third, this stop placement is perverse. Mobility-impaired users making connections from Colman Dock benefit very little from having the 12 available, and other users transferring from buses on Third to the 12 have to walk unnecessarily far. Fortunately, the problem should be easy to fix. There is no physical obstacle to locating a stop on Marion at Third, next to the north side of the Central Building. To maintain schedule and reasonable stop spacing, the stop at Second (which is actually less than a block from the stop at First) could be removed. 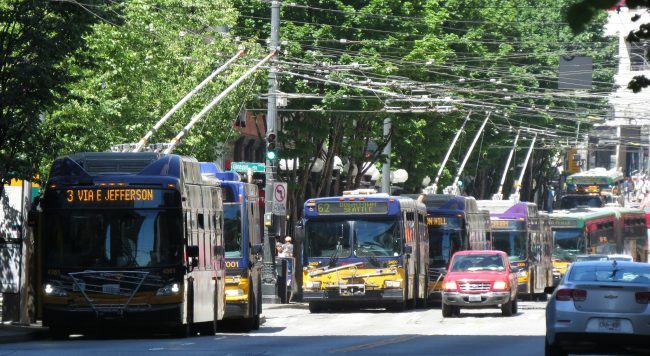 Metro and SDOT may be reluctant to fund this fix, despite its simplicity, because bus service on Marion is going away. RapidRide G, the “Madison BRT” route on which SDOT will soon begin construction, will run eastbound along Spring rather than Marion. From Spring, the new route will provide easy access to Third. But RapidRide G will not begin service for two more years. Mobility-impaired users are losing route 62 now, and deserve this easy, inexpensive accommodation in the meantime. I once drove an Americana on Route 358. Passengers were as confused as I was. Photo by LB Bryce. It wasn’t so long ago that Metro service changes arrived in the dead of night, accompanied mainly by dread about whether your favorite route would be on the chopping block. But it’s amazing what a few years of explosive economic growth will do. County Executive Dow Constantine trumpeted Metro’s service changes starting next Saturday, September 23 in a press release, which noted that this will be the sixth consecutive service change in which Metro adds new service. Between Seattle voters’ approval of Proposition 1 and increased Metro revenues, Metro will be running the most service it’s ever run. The headline news with this service change is the welcome replacement of the last three “Night Owl” routes with expanded late-night service on selected regular Metro routes. But there are other good changes too, including some real frequency improvements and an encouraging number of well-thought-out “bug fixes.” Learn more about what’s happening below the jump. Today’s pedestrian view at the Lander crossing. Photo by Peter Lewis. For many years, SDOT has sought to build an overpass separating cars, trucks, and buses on Lander Street in Sodo from crossing train traffic. Last time we checked in, the project was included in the Move Seattle project list and had secured a $45 million federal grant, but was still $40 million short of full funding. On Wednesday, the city announced that it achieved full funding, thanks to a combination of a $17 million lower cost estimate after final design, additional appropriations from the City Council, and an additional $10 million contribution from the Port of Seattle. Construction is expected to begin next year, for completion in 2019. The project has been controversial among local urbanists, because it is expensive and intended primarily for vehicular traffic, especially Port of Seattle truck traffic. I think the concept of the overpass has more merit than is often acknowledged, because it would improve bus reliability and has the potential to make walking to transit safer. The benefits to bus reliability already look promising. Lander is the primary transit-accessible route between the West Seattle Bridge and Sodo destinations. Today, it serves one major frequent bus route (5/21), one infrequent local route (50), and a few commuter routes. Anecdotal evidence suggests that train crossings at Lander are responsible for a substantial portion of overall delays on routes 5 and 21, especially northbound route 5 service. 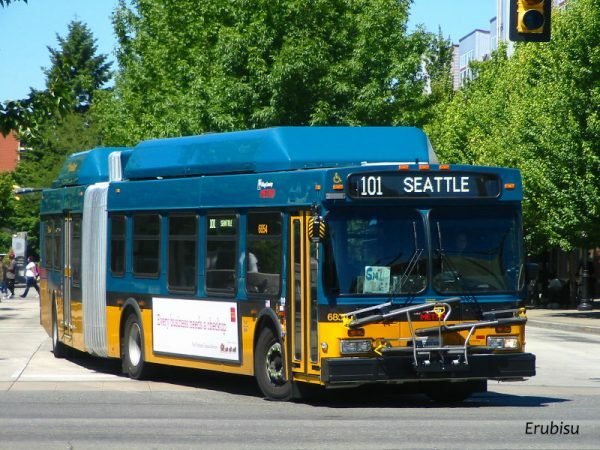 In its long-range plan, Metro expects to expand service on Lander further, upgrading the frequent Sodo-West Seattle route to RapidRide (while changing its routing) and adding a pair of routes that would provide frequent service to South Park and Tukwila. A Lander overpass would improve reliability of all of these services substantially. 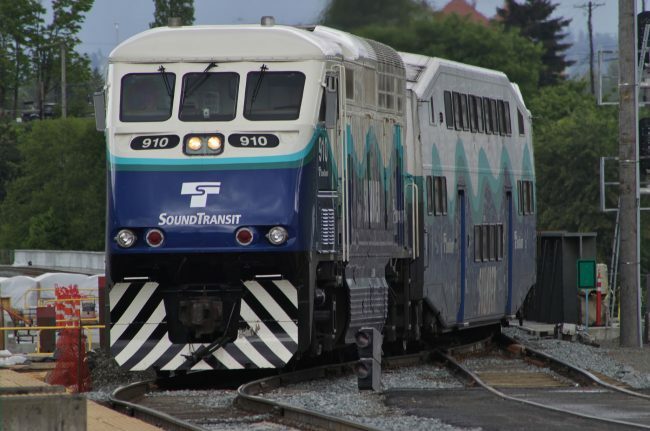 This Sounder train will have positive train control operating next year. Photo by Bruce Englehardt. 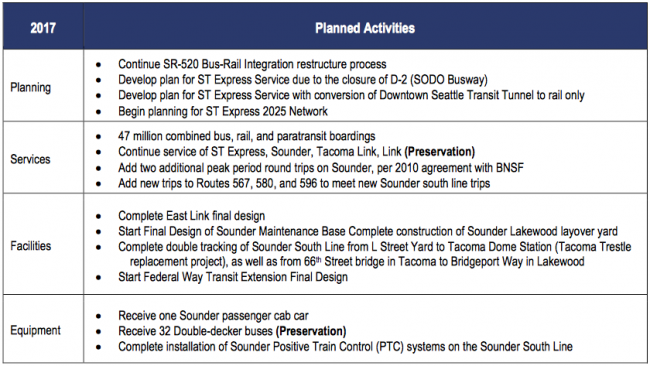 On Wednesday, Sound Transit quietly released a draft of its Annual Report and 2017-2022 Transit Development Plan. The TDP, which state law requires ST to complete each year, operates at a higher level than the Service Implementation Plans released in the fall. While the TDP offers less granular detail about the agency’s plans than the SIP, it gives us a glimpse farther into the future. the start of the planning effort for the ST Express network that will operate once Lynnwood Link, East Link, and Federal Way Link open. The last of these is a long-term effort that will continue from now until 2022, and will take place in cooperation with similar planning efforts by Metro and Community Transit. We likely won’t see too much about it in this year’s SIP, but it will be major news as the early 2020s draw closer. The TDP delivered a couple of other minor news items. 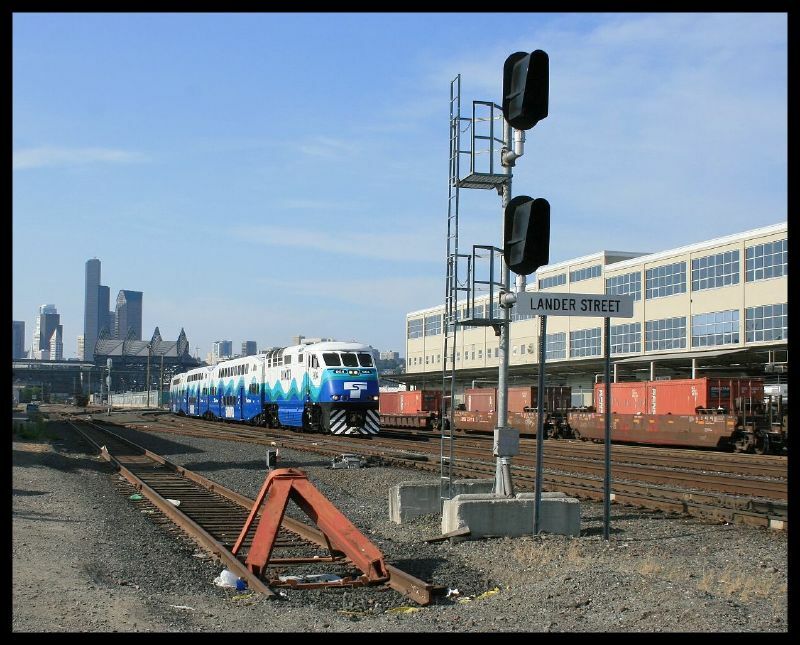 First, ST and BNSF remain on track to complete Positive Train Control hardware installation on the South Sounder line this year, with the technology becoming fully operational next year. PTC is a safety technology designed to prevent trains from entering already-occupied track segments even if an operator fails to observe a red light, and likely could have prevented several of the USA’s worst train accidents. Second, ST continues to eschew fleet standardization for ST Express, with double-decker buses, commuter motor coaches, and articulated hybrid buses all slated to come on property within the next few years. Buses that entered service in 2005 or earlier, including ST’s original order of hybrid buses, should be replaced in 2018-2019.